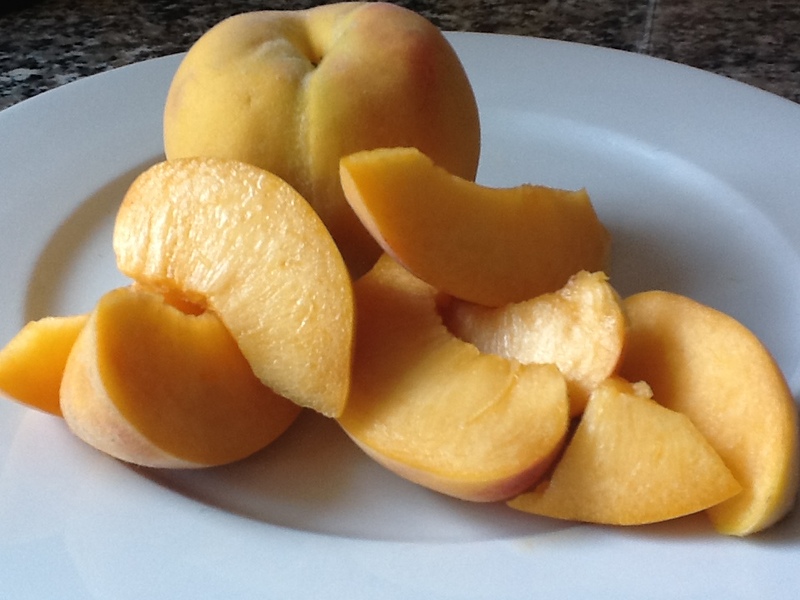 Golden queen peaches; my perfect breakfast. This is my favourite time of year. The weather here in Auckland is generally pretty fantastic; warm, sunny, settled, and way less humid than January. Add to that, we’re about to celebrate both my partner’s and son’s birthdays and (should I admit this), even better, it’s peach season. Actually that’s not quite true; I love Golden Queen peaches. And I love them best when they come from my favourite orchard – Boric Food Market in Kumeu, Auckland. Boric is one of the central landmarks of my cognitive map of Auckland map. I remember as a child being driven there in the back of our old Vauxhall on what constituted a major day out. These days, Boric is a 15 minute drive from home along our snazzy new motorway, but when I was a kid in Bayswater, it was WAAY out in the sticks. But still we went there at this time of year and bought peaches. In those days, they came in little rectangular wooden boxes that would be turned into “canoes” later that my brother and I would paddle around the lawn on our “last of the Mohican” adventures. On the way to Boric, I pass six or seven other old style fruit and veg shops. Actually, I shop at quite a few of them on a regular basis and I’m pretty happy with the produce and the service. In some I’m well enough known that the women on the checkout can guess what’s for dinner that night in my house on the basis of what’s in my basket. We even trade recipes. But although it’s further away and I know I’m burning fossil fuels to get there, as long as I live in Auckland and Boric stays open, I will shop there. It’s partly because it is such a part of my world and even though the old shed has been completely revamped into a fairly upmarket grocery shop, it’s still kept the same feel. That’s probably because it’s been in the same family for generations (since 1942 I think) and the current generation still works there. There are even staff members who I remember from 12 or so years ago when I came back from the UK and used to take my then toddler son shopping with me. It’s a family business that has remained true to its community. It might look flash and sell gourmet meat and chocolates these days, but the fruit and vegetables are still fresh, affordable and best of all – in many cases grown on the property. And that’s the other reason I will continue to shop at Boric. They grow stuff and sell it where its grown. Apples, peaches, plums; varieties you can’t find in supermarkets and shops that just buy in whatever is available at the wholesale markets. When I was a kid Auckland was full of orchards like Boric. In Albany, near where I now live, there used to be three fantastic orchards and a strawberry garden that let you pick your own berries. Most of the apples and pears I ate as a child came from land that is now home to several schools, housing estates and an industrial park. The junior high school has displaced the strawberry farm, and my son’s old preschool stands on the site that used to grow the best Braeburn apples – ever! Sometime in the 1980s and 1990s, Auckland stopped growing food. Land that had sustained generations was subdivided and families moved onto their little piece, covering their yard with decks and patios and not even planting the odd fruit tree. More and more people have moved to Auckland and at the same time, the food needed to sustain us comes increasingly from other parts of New Zealand – and the world. There are still ghosts of the old orchards. At the end of my street there is a reserve with 30-40 plum trees. Every January they produce masses of sweet, succulent fruit. Most of it falls to the ground and is eaten by birds. But every year some of it finds it way to my kitchen and the jams and sauces I make to remind me of how precious local resources are. I’d like to say that the some of the Golden Queen peaches I bought yesterday might make a similar transition, but honestly – I’m more likely to just eat them fresh. 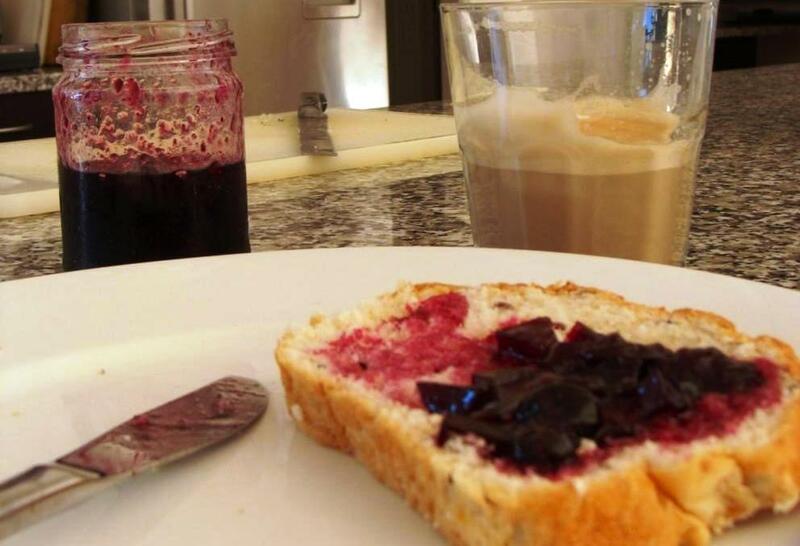 Toast and homemade plum jam; for when there are no peaches for breakfast. Around the world, people are starting to realise the value of growing the food they eat – where they live and eat it. I applaud that, but at the same time lament the fact we ever forgot in the first place. Disclaimer: It occurs to me that some of this reads like an advertorial. It’s not. I’d like to make it completely clear that the only relationship I have with any of the businesses (or families) mentioned in this post is as a normal paying customer. What do you give to the person who has everything? Probably the greatest gift would be the ability to live with a little less. Far more than any consumer addition, they will treasure the ability to be free. 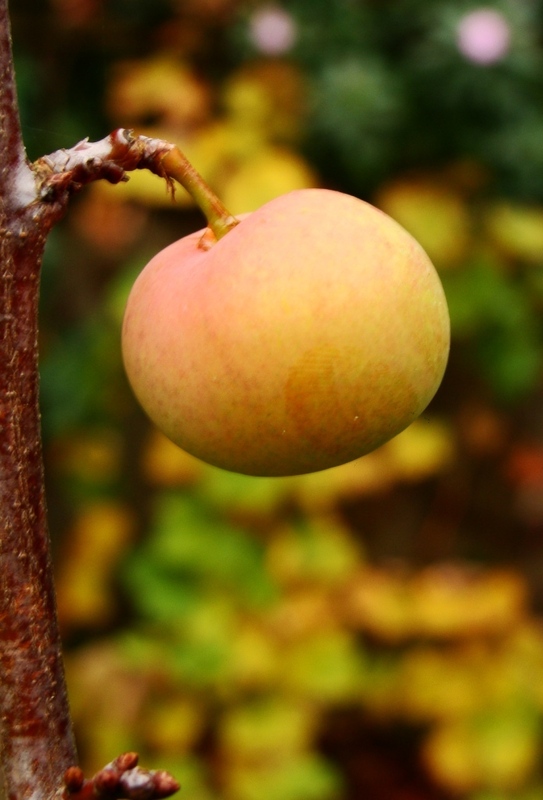 A single plum ripening on my tree. The quote is from a piece called “Living with a little less”, and it’s stuck in my head for the last week or so; becoming a lens through which I see more clearly the things that are going on in my life at the moment; from de-cluttering my house, to planning meals around what’s ripe in my garden, to the way I am looking at tv advertising, politics, the environment … even trying to improve my health can be understood as living with a little less … of me. The powerful philosophy of the consumer society moves us into an additive mode of thinking, but even the wealthy reach a point where they feel the need to have a garage sale. In global terms, I am one of the wealthy—and now it’s time for my garage sale.